Lumix DC-G9 Mirrorless Micro Four Thirds Digital Camera (Body Only) is rated 4.8 out of 5 by 51. Rated 5 out of 5 by Greg N. from Blown away! There isn't a creative and impact-full (enough) way to properly describe how incredible this camera is. Coming from high end Canon systems I was not expecting to love the G9 so much that I would actually sell off my Canon bodies but it has happened. There are so many many great reasons for this to be your camera to be your next camera, literally about a thousand reasons.... but the 2 most important are these: I can take beautiful photos with increased control and speed with the viewfinder's amazing capability. The second reason is that this camera makes me want to get out there and take more photos. It's a camera that inspires. Rated 5 out of 5 by Neil from Great Camera! I have had Canon 5D MK-iii since it came out and others before the iii. I might keep the 5D and a lens or two just in case of a real special situation but this Lumix G9 is one fantastic camera. It is now my goto camera for all uses. Have a Leica 12-60mm and 8-18mm, super lenses, had Canon pro (white or red stripe) before. Will soon have the Leica 100-400mm and that should be it. I'm not going to extol its virtues, there are plenty of reviews/how-to videos on YouTube that do that for me. I bought from B&H due to their previous good customer service and to take advantage of their 30 day return if I did not like the camera. I knew in less than 7 days it was a keeper. Rated 5 out of 5 by Emilio from Way better than GH5. Best micro 4/3! I bought the GH5 a while ago and I regretted the minute I tried the video. I immediately I realized that the Olympus OMD 1 mark II had a way better image stabilization for video and photography. The G9 has the best image stabilization that there is out there. With the right lenses is almost as good as any full frame camera for photography. Panasonic make the easiest menus and easy to work with cameras in the market. Love the EVF! Love the ergonomics and the looks but feels more plasticky than the GH5.? Weight decrease is unnoticeable and feels bigger in your hands than the GH5.? If you are not a professional film maker, get the G9... and if you are... buy the G9 and see what it can do for video. Rated 5 out of 5 by Jayasimha from Great travel camera! I have used this camera mainly as a compact photo solution for not just travel but also wildlife. After a couple of firmware upgrades, the continuous AF has significantly improved but as the date of this writing, CAF focus aquisition and occasionally tracking can be a challenge even though I am using Leica branded lumix lenses for birds in flight. However, with a hit rate of 70-80%, it serves my purpose. I do find that CAF functions slightly better in Olympus OMD em1 MII and Nikon D500 per my preliminary tests. However, when you nail the focus, the results are exquisite and no issues at all during street , land scapes and other photographic genre. Rated 5 out of 5 by Henry from Great camera! Three years ago I ditched my heavy Nikon kit (lenses and all) in favor of a used Lumix G1 with it's smaller, more portable, micro four-thirds system. Last year I bought the G9, the finest camera I've owned.. I used all five of my lenses on a recent trip to the Blue Ridge Parkway shooting sunsets, light-painting, and hiking through woods, streams, waterfalls.. I carried the kit comfortably in my backpack with tripod. This camera is fun to use. It's very intuitive, the menu system is logically organized - something most brands can't say. It has every option I'll ever need. My pics came out with great tonal quality, colors, and detail. Don't believe all the Nikon/Cannon hype. This G9 with m4/3 system made a believer out of me. Rated 5 out of 5 by Jun from Fantastic Camera with Great Usability I am a long time Canon shooter but have used M43 Systems for several years. This is my 5th M43 camera. My other main M43 camera is Olympus EM-1 Mark II. Compared to my Canon and Olympus cameras, I especially love the ergonomics and user interface of this camera. Canon is known for its usability and interface, but I like this camera's interface even better! The three thumb wheels allow me to directly control the aperture/speed, exposure compensation, and ISO separately. The top LCD plate, well placed AF joy stick, buttons, and dials made the camera easy and fun to use. Rated 5 out of 5 by O'Dell from Great camera I recently picked up a G9 from a local shop, and sold my Nikon D500. While the D500 has a better auto-focus, I find the G9 equal or superior in all other ways. The image quality is at least as good, I don't see much difference in iso performance, and the colors are good. (see pics, my cat is at iso 2000 and the duck is at 3200) In addition, it's noticeably lighter without being too small. The ergonomics feel quite similar to the D500(which is a big plus for me), and it feels every bit as solid and 'pro' in the hands. Rated 5 out of 5 by Bob from Impressed... I have been a Canon shooter for quite some time (5dmiii & 7dmii). I used to scoff at micro four-thirds. To me, it always seemed like a step in the wrong direction. Then I purchased a G85 last year for a good price. I was blown away by the features, and overall quality of the teeny-tiny sensor. I am a portrait and wedding photographer (well I was for about 10 years, full-time, and now I shoot professionally about 1-2 times per month). I decided to pull the trigger on a G9, and do not regret the purchase. There is a learning curve coming from full-frame, and it is key to use good glass. I am currently shooting with Panasonic 35-100 f2.8; 25 f1.7; 42.5 f1.2 Leica ; Olympus 12-40 f2.8. It is a great camera! Does it have any anamorphic video modes at 50/60p? Not that I'm aware of. I think only the GH5 and GH5s have that ability. The G9 is more photo-centric camera with nice but limited video features. 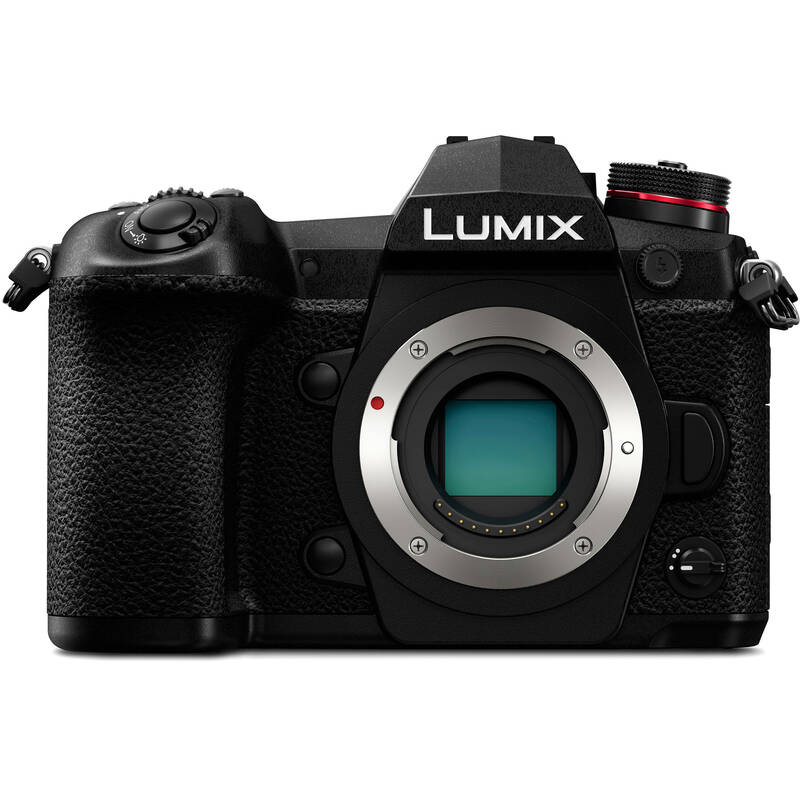 The Panasonic Lumix DC-G9 Mirrorless Micro Four Thirds Digital Camera (Body Only) B&amp;H # PADCG9 is currently in stock. Can this camera do high speed sync? I have profoto lights and do action photos. No, its maximum flash sync speed is 1/250 sec and the camera does not have a dedicated high speed sync (HSS) mode. Is the Russian or Ukrainian language menu supported? No, sorry the Panasonic G9 models sold in the United States only support Japanese, English, German, French, Italian, and Spanish. will the quarantee in Canada ? The warranty is for the US. If you need to use the warranty you would need to send it to the US facilities. However, we do have Squaretrade available with the G9 which will cover the camera internationally, including Canada. I have several older Panasonic Lumix lenses with either power or mega IS. Should I leave the lens IS on or off with the G9? Will I see any effect on my pics either way? If your specific lens is listed as compatible by Panasonic on their website for Dual I.S. or Dual I.S. 2, if you leave the Image Stabilization switch on your lens to ON, you would benefit from both the stabilization in your lens and in your camera. For full compatibility, your camera and/or lens may require a firmware update. If you type or copy/paste &quot;Compatibility with interchangeable lens (Dual I.S. / Dual I.S.2)&quot; into your preferred search engine, it should show you a page from Panasonic's website that lists the lenses and camera combinations (along with the required firmware versions) that will support Dual I.S. or Dual I.S. 2 with the Panasonic Lumix DC-G9 Mirrorless Digital Camera. Will the guarantee in Canada? This camera, as with most of the products USA based B&amp;H sells, comes with a USA Limited 1-Year Warranty. If you wish, you can purchase a Square Trade protection plan that is valid anywhere in the world. That option becomes available once you place the camera in a B&amp;H Shopping Cart.